1. It's okay to have some real ice cream now and then. I have surprised myself with the amount of Maggie Moo's and Coldstone combinations I have been willing to try. Who knew that freedom could bring such a sense of adventure with ice cream and mix-ins? For the record, cheesecake ice cream with strawberries and graham cracker crust has been my favorite so far. 2. People always smile at you. I'd like to think it's because everyone has a memory of someone they love in the big and pregnant stage and smiles fondly at the thought of that person and the baby that entered the world through them. 3. Expectant Mother Parking Only. I have only found this at Babies 'R Us and Best Buy. Oh, how I wish other stores would catch on. 4. If you lie down for a nap, no one sees this as laziness. It's viewed as taking care of yourself and baby. 5. 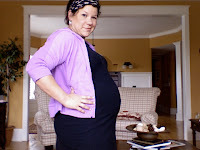 My husband tells me every day that he has "the cutest pregnant wife ever". I'm sure many fathers would disagree as they remember their wives in this stage, but when Jason says this it makes my day! 7. The daily reminder that there is LIFE inside my tummy. The kicks, jolts, and flutters reassure me that God is in the business of doing miraculous things. 8. Knowing where every single restroom is in this city. I'm convinced this is good preparation for motherhood because it seems like any "mom compass" always knows exactly where to find the restroom when it's necessary. 9. Prenatal vitamins do great things for your skin, hair, and nails. 10. It's good to be a caretaker. By this I mean that I have to think about all my activities, meals, drinks, medicines, and countless other things in relation to the baby I'm carrying. What a tremendous lesson in learning how to choose what's best for another human being, even though it might not be what I want. I feel certain the world might be a better place if we all lived such a constant life of self-surrender...and it probably involves way more than giving up caffeinated Cherry Coke and sushi. Hi, I surfed on over from Amanda's blog! I think we may have met in the GAP class at Travis a long time ago. That is a great list! Congratulations on your little one!